Photography was always second for me. I’ve always thought of myself as a writer. Taking pictures was just something I needed to do for work to go along with my stories. In a way, I was completely naieve, and perhaps a little cocky. I always thought whatever a picture could show, I could describe in a way that I could grip the reader in the same manner that a powerful image could. Pictures have a power that words simply do not. Words can describe the devastation from a fire, but they can’t truly show the anguish or grief felt in a photo of say a weeping survivor. Words can describe a person, but they can rarely make you feel intrigued by someone the way a good portrait can. It’s from learning these lessons that I have since fallen in love with photography. It’s an extremely difficult craft, and one today’s professional photographers don’t get enough credit for. Everyone with a cell phone calls themselves a photographer these days. I’ve been fortunate enough to learn from some of the best photogs in Durham Region throughout my time at The Express. I’ve also spent hours reading, watching videos, and simply out taking photographs to try and hone my skills and make better images. This first set of photos come from my work at The Express and The Pointer over the last 12 months. Taking pictures for newspapers comes with its own obvious challenges. Whether you’re battling the elements, a deadline, closed roads, faulty equipment, or whatever, when it comes to news photography, the paper needs an image, regardless of the circumstances. Sometimes, there’s simply no choice but to get the best image you can. The pressure can be a lot sometimes, but that can also play a role in creating some powerful images. Here are my favourites from 2018. A fire inspector combs through the remains of a fire in Oshawa that killed four people in January 2018. I like this image because of the dark, negative space on the left that is only broken by the charred wood, and that the subject is perfectly framed in the doorway. Not long after a deadly fire killed four people in downtown Oshawa, an auto parts business in south Oshawa was fully destroyed by a fire. It was pouring rain in the early morning as I pulled off the highway and immediately saw the column of smoke. By the end, I, along with my camera, were fully soaked, but were able to get some amazing action shots full of movement and amazing colour. Another early morning assignment after a drive-by shooting in South Oshawa. 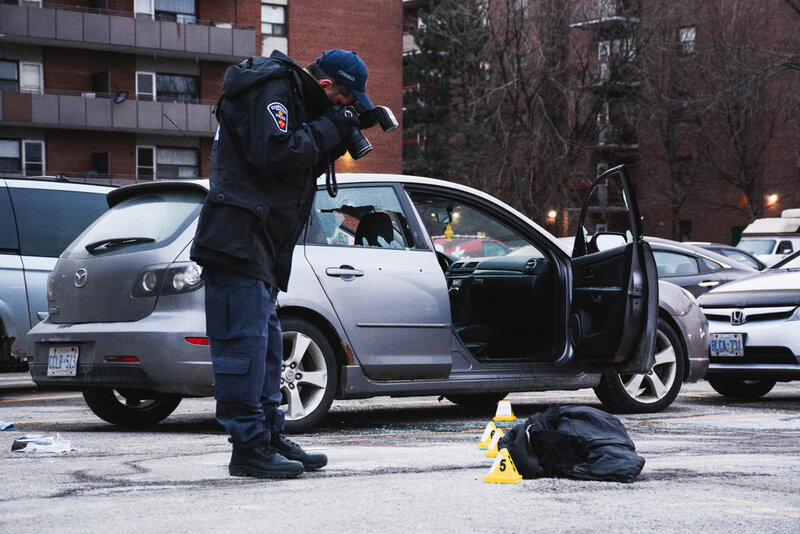 This shot landed on the front page of The Express with the headline “Bloody Sunday”, and I think perfectly captures the scene with the police investigator in the foreground, the open door and broken windows of the car, and the bullet holes in the door. Patrick Brown swept to victory in the Brampton municipal election in October, after being toppled in January of this year from becoming the next premier of Ontario. It was obviously a special moment for him as he took the stage for his victory speech after the election results were finalized. I think this image sums up the feelings of him and his wife perfectly, while also showing a bit of the surging and celebrating crowd. 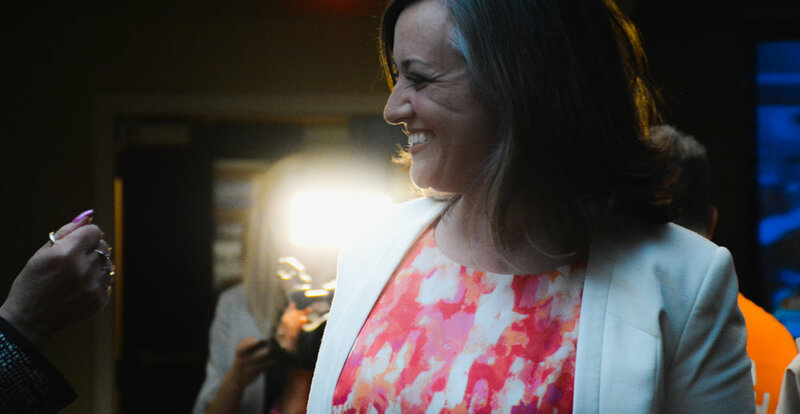 After defeating a tough challenger to retain her seat as Oshawa MPP, Jennifer French walks into her celebration party on election night. It was a quick, loud moment as cheers erupted and people rushed to greet her. The movement and the dark room made getting a clear, crisp shot difficult, but there’s something about this one that always stands out to me. Taken to go with a story on the Human Trafficking Unit and its ongoing effort to stop human trafficking in Durham Region. The typical shot for a story like this is to get the subject sitting at his desk “working”. However, I wanted to do something different. I wanted natural light (because it’s always better), and I’d scoped this location out ahead of time because I knew it would make a cool reflection in the glass and the windows and windowsill are excellent leading lines directly to the subject. I think both of those just draw your eye right in. As I mentioned in yesterday’s post about my top stories of 2018, this is one of my favourite portraits of the year. Not only is the natural light absolutely perfect (it’s taken inside the atrium of the RMG), but the pose is so natural and Linda’s expression perfectly matches the bittersweet tone of the retirement piece it went along with. For a follow-up story I wrote after Jennifer French’s election victory, I wanted to get a new portrait of her, as we’d already run my election victory photo (which you would have seen above). Again, I went with getting as much natural light as possible (noticing a trend here?). Thankfully, I’ve worked with Jenn on a number of stories throughout my time at The Express, and I think it helped to capture a perfectly natural smile. In my first photo assignment for The Pointer, I needed to get an engaging portrait of Patrick Brown to go along with a profile one of our writers had penned on his run for Brampton mayor. We arranged to meet outside of Brampton city hall. I arrived an hour early in order to scope for good locations and pin down my ideas. I knew I wanted a lot of negative space in the photo, preferably dark, and I knew Brown couldn’t be smiling, as it needed to convey a more serious tone for the story. The end result is probably one of my favourite portraits I’ve ever snapped. This was a difficult one to capture, in many ways. I met Linda for our interview at her campaign headquarters, which being early in the campaign, was still in the process of being set up. That was fine for the interview, but when it came time to get a photo, it didn’t leave many options to get creative. I came up with this shot by stepping outside of the campaign office and shooting through the front window. The end result fits quite nicely with The Pointer’s alternative style. As a photographer, you handle a lot of expensive equipment, equipment you want to keep as clean and dry as possible. However, this photo shows that sometimes, it pays to get a little wet. The interesting light effect on the left side of the image is a result of water being on my lens. This was snapped during an early morning fire in Oshawa, and it was pouring rain outside. I had a plastic bag over my camera body (mostly saving it), but the lenses are always the the hardest hit. It was only after, when doing some editing on other images, that I realized just how great this image was. We used it many times in The Express for feature stories on the fire department. I needed an image to go along with a story on the Oshawa Harbour and the many changes and financial uncertainties that were hovering over it and the Oshawa Port Authority. I got lucky. When I headed to the waterfront, the water was roiling and the wind was ripping against the shore. I probably looked like a crazy person crouched directly at the water’s edge, running away as the large waves rushed into the sand. The photo was well worth it in the end. It ended up running on the front page. The demolition of the Five Points Mall in Oshawa wasn’t really a big news story, and it went down without much fanfare. It was a pretty old structure. However, who would want to miss a giant building being torn down? I got there in what happened to be perfect time as the giant glass pyramids began to be toppled from the roof. I wanted to be sure to get a person in the shot as well to show the scale. Having the subject raised on the back of the truck made it easier to frame the photo and have great balance. Heritage advocates were working hard to stop this home from being uprooted from its foundations and thrust to the back of its large estate to make way for more development. It’s not the most interesting of shots, but I like the leading lines of the pathway and the overgrown state of the property. I also love the colours, with the mostly natural tones and then the splash of pink from the tree blossoms. Battle reenactments at the Oshawa’s Ontario Regimental Museum were always fun to shoot. The two years I was fortunate enough to get the assignment, I made pictures that landed on our front page. This one from last year is one of my favourites. In one of my final assignments for The Oshawa Express, I travelled to Ottawa to spend a full day with Durham MP Erin O’Toole. Here, he greets a group of Durham students visiting Ottawa. It’s not the greatest composition, but I like the many faces in the photo and the sweeping line of the curb framing all the kids. The fact that the main subject’s back is to the viewer also adds an element of intrigue. One of the challenges with my in-depth feature series on human trafficking was finding images to go along with it. Thankfully, I had a few ideas, and M was more than happy to play model for me for a while. I wanted the photos to be filled with shadows to convey the sad, ominous tone, and I wanted to play around with light. I made many images with several different poses before settling on four that I was happy with to go along with the series. This was my favourite. I just like the fingers gripping the hair, the faint bit of light shining upward. I feel anxious just looking at it, so I think many others would as well. Covering the Oshawa Generals was definitely one of the highlights of my four years at The Oshawa Express. During 2018 I covered countless games, and there are many action shots that I’m proud of. However, there’s something about this image that I like the most. Perhaps it’s the framing of the camera hole on the players, or the many different subjects. Sometimes, you can’t explain why a photo works for you, sometimes it just does. Also, I’ll thank the Gen’s photographer Ian Goodall for the inspiration on this shot. I saw he’d taken something similar to this a few weeks before this game and got inspired to try it myself. One of my initial introductions to the power of photography was through skateboard magazines and the many different styles of pictures you can find within their pages. For that reason, I always love the chance to shoot skateboarders in action. For this shot, we needed something for the front page of our edition after the May long weekend (if I remember correctly). Anyway, the sun was out and I headed directly for the skatepark. I visited two parks before finding this one and a group of guys who were willing to let me hang around and snap their photo. It’s an unwritten rule in skate photography that the guy needs to land the trick for the photo to be included in a magazine. It took a few tries, but this guy eventually nailed this lipslide and I ran away with this amazing image.